Since my experience with GBS I've been inking almost exclusively on my iPad. I've gotten quite adept at it and the process I've developed offers some advantages even beyond aiding my recently damaged nerves. But there's still something about inking on paper that I just love, and I've missed it dearly. So I've started relearning and reshaping my process so that I might again ink on paper, at least when I want to. The main thing that's facilitated this has been using the Kuretake brush pen recommended by Ryan Andrews. This pen is great, and it's just much easier to use for me than a brush. I still have some problems controlling the brush, and I'm still prone to dropping it, for some reason. But the brush pen's fat form has stayed firmly in my grip through much experimenting, and so I decided to try making a finished work with it. While there are things I really like about the iPad version, for the most part I really prefer the hand-inked one. I'm partial, of course; I just love original comic work, it's something I just love looking at. It's also something I can give to people. So now I can actually give my friends this original drawing, which I expect will look much nicer than a digital print. At any rate, I'm psyched to be inking on paper again, and pretty pleased at all the drawing options I've developed since getting sick. My illness, while a total drag, has at least pushed me in some new directions. And that's not the worst thing ever. I've been obsessed with zombies lately. 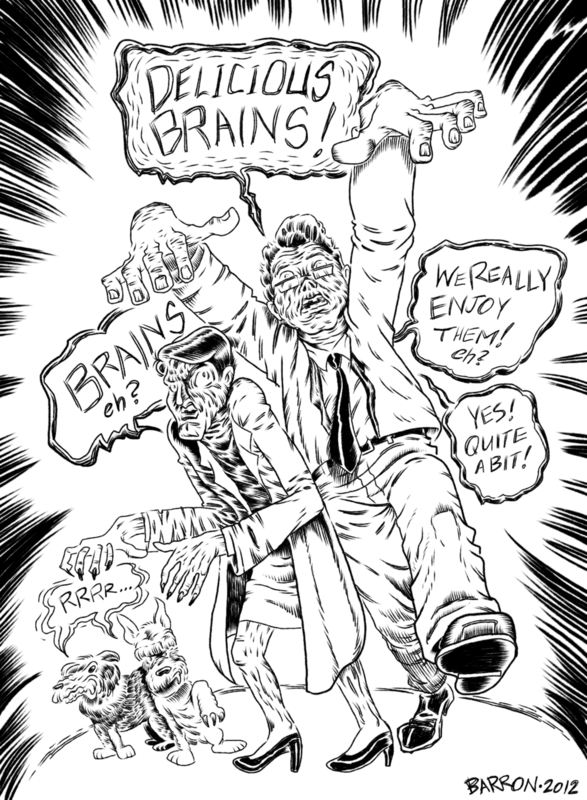 More specifically, I've been obsessed with drawing zombies. It is the funnest thing ever. I have so many and am cranking them out so fast that I made a Tumblr for them. It's called Zombies, Y'all, and it's just drawings of zombies — scary ones, funny ones, weird ones — all day and all night long. If you enjoy zombies like I do, check out Zombies, Y'all.